I am so excited to be finally writing this post. The fiance and I got our pre-wedding photoshoot done sometime end of June but for some reason or the other this post has just got delayed and delayed. Sorry. 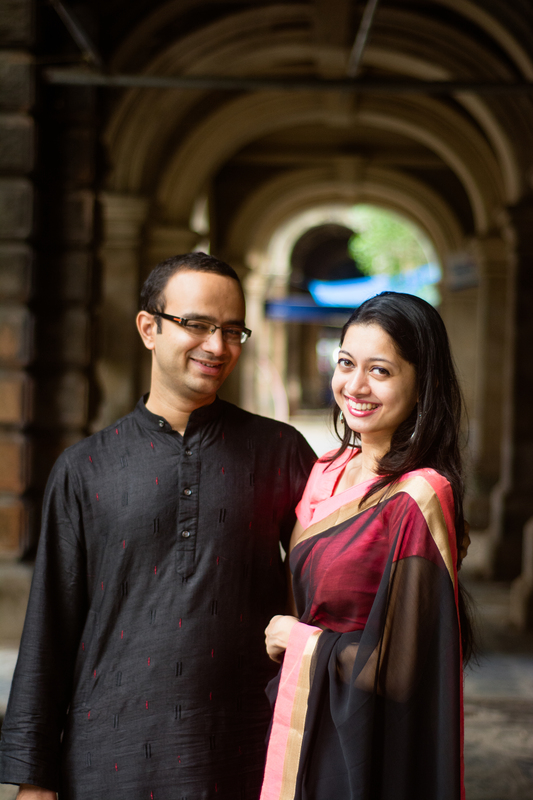 He had come to town to meet me and I thought there would be no better or alternative time available to capture some pre-wedding memories together. Our day started really-really early. 4:30 am I was up…why? Because the place for the photoshoot that we had decided was CST and locations in and around (hanging gardens, asiatic library, marine drive etc etc) – which was like 20+ kms from my place. I somehow got ready and decked up…and we were out by like 6:15 am sharp. By 7 am we had reached our meeting point and my awesome photographer Ruel Rebello was already at the location with his camera ready. First stop was the lane bang opposite CST station. Ruel had picked this location for us because of the old arch-corridor look. It was still early in the day for the crowd to be there, so it was kind of perfect privacy to pose and do silly stuff except for one thing. A sweeper ! He was so amused by what was happening that he left his broom and sat on the bench right next to us to witness the whole thing. At first I was giggling about it, but then it got a little strange when he would change his place of sitting whenever he couldn’t see us clearly. I think he thought we were eventually going to make-out or something, which he didn’t want to miss…but it was so creepy. But anyhow, now that I think about it…I wonder how celebrities deal on a daily basis with people blatantly staring…kudos to them. There was this one place (will update the name) where we started shooting around 8ish. There were few people walking around at that time. We were simply posing when one guy came up and asked my photographer, “permission liya hai kya. Yahaan pe aise photos allowed nahi hai“. I was like completely baffled by that. We were like what the hell…. (a) Who are you to tell us anything. (b) You are not the authority. But with one harsh tone, we just shushed him and within no time he disappeared without causing much fuss. We then moved to hanging gardens…I love this place because as a kid my parents would bring me here quite often. I think in a place like Mumbai, where it is all buildings and malls, this place is definitely a must go to for photoshoots. Its just so green, and you have gorgeous steps and every nook and corner is worth clicking pics at. When I planned this photoshoot, there were a lot of things that went into it. I looked at what people normally do these days, props, read articles and asked for suggestions from my friends and folks. Eventually, I drilled it down and decided I will carry few easy-breezy props around that are not too difficult to work around with. Props used: Confetti, Bubbles, Umbrella (forgot using, all thanks to no rain), chamki gift wrap paper – all of it which you can easily find in some local stationary shop. We wrapped up by lunch time, and by then my saree was done with. I ran into Starbucks and got changed into something that was zillion times more comfortable and easy to wear. But the Photoshoot was not over yet. Post this, we moved to the other end of town – New Bombay and some other locations. From getting a dent in the car to going near crocodile infested waters, stay tuned to know what happens in the second part of the photoshoot. Coming up super soon on the blog.